Marvel has taken a group of the their more colorful characters and added them to project called the Offenders. 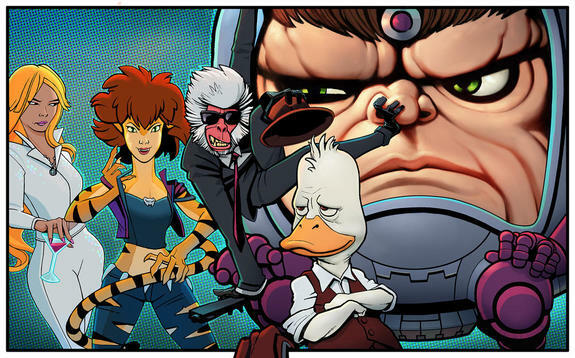 The characters of MODOK, Hit Monkey, Howard the Duck, Dazzler and Tigra are going to recieve 4 individual shows and a 5th show, "The Offenders" will see the characters come together as a team. The format is seems to be poking fun at the Marvel Netflix show that brought together the separate heroes together to form the Defenders. Marvel has enlisted a well array of Comedians to bring the different animated shows to life with Kevin Smith taking on Howard the Duck, Chelsea (Didn't know she was still alive) Handler taking on Dazzler, Patton Oswalt taking on MODOK and Hit Monkey will come from writers osh Gordon and Will Speck. The animated shows will appear on Hulu. This is marks one of the first projects started between Marvel and Hulu. Here are some Howard the Duck Toys.